Chandak Imperial Galaxy is one of the residential developments of Chandak Builders, located in Kanpur. The project offers 3 BHK and 4 BHK apartments. It is well equipped with all the amenities to facilitate the needs of the residents. What apartment sizes are available in Chandak Imperial Galaxy? The project offers apartments sized between 1950.0 sqft and 3080.0 sqft. 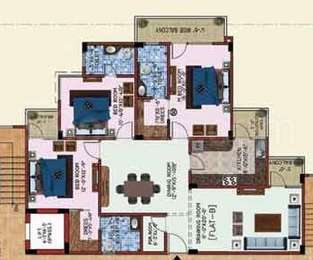 What is total area of 3 bhk in Chandak Imperial Galaxy? 3 BHK units in the project are available in a size of 1950.0 sqft. What is size of 4 bhk in Chandak Imperial Galaxy? The area of 4 BHK apartments ranges from 2280.0 sqft to 3080.0 sqft. How many units are there in Chandak Imperial Galaxy?There are 24 units available in the project. Does Chandak Imperial Galaxy have badminton court? The project doesn't have a badminton court.